13:20 – I was going to feed him lunch, but he fell asleep. I don’t want to wake him up, so I’ll have a cup of coffee and wait for him to wake up. 13:45 -He woke up when I needed to get up. After a potty break outdoors, we went into a room with his bowl of food. He was still a bit tired, but hungry for food. I held the clicker behind my back to begin; you don’t want to scare the puppy with the sharp noise of the clicker. I took a big chunk of food in my other hand and held it behind my back too. I stood completely still. Clicked. Brought out the hand with food and let him have a little taste. Then I took both hands behind my back again and repeated after a few seconds. After a few times, I started to look for behaviors to click. As he was standing so nicely, I decided to click standing still and when he moved a back foot to correct the standing to a better position. 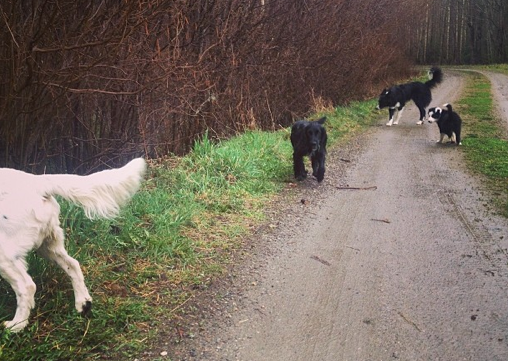 14:00 – A little walk with Win, Pogue and Kat. Wilco really tries to get the grown-up dogs to like him, but they are not giving him any response to his polite attempts to make contact. I feel a bit sorry for him. 14:30 – He’s fallen asleep again. I thought that he would be full of energy now, but he likes to sleep in the afternoon. 15:00 – He woke up when I moved, but just chewed on his toy. I’ll take him out when he gets up. 15:15 – Pottied outdoors, and fallen asleep again. I’m trying to make treats for him in the oven. Ground lamb, eggs and psyllium seed husks mixed. We’ll see how it turns out! 17:00 – Slept until now. Woke up when a friend came to visit. He is energetic and wants to bite everything while we have coffee. 18:00 – We go for a little walk with my friend and her puppy-friendly dog. 18.30 – Sleeps some more while we do herding with the grown-ups. 19:30 – Out to potty, and we do a little training and socializing. I introduce a release cue (“fri”) when he offers sit, and I get a few successful recalls when he is greeting another dog. 19:40 – Plays on his own indoors. 19:50 – I take him out to potty. He falls asleep when we get in. 20:00 – Sarek barks in the other room and Wilco wakes up and looks a bit worried. I let him have a few pieces of kibble on the floor, and he eats them before he falls asleep again. 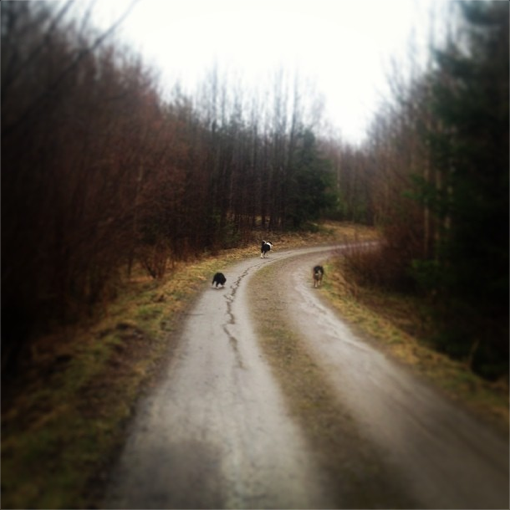 20:15 – Thomas lets his dogs into the house after a walk and Wilco wakes up. I take him out to potty again and when we get in, he lies down in his bed. 20:35 – Two accidents in the house in five minutes. Fail! 20:50 – We work on going in his bed, staying there and leaving it on “fri” while Thomas is using the vacuum cleaner in the same room. Good puppy! 21:15 – Dinner, and a raw stalk of broccoli to play with/investigate for dessert. And then out to potty of course. 21:40 – Accident in the house again. 21:50 – Out to potty with Thomas. 23:05 – Still asleep and I’m about to go to bed. Good night! Today, I will report on how a day looks for Wilco, 8 weeks, and me. It’s a very ordinary day. Nothing on the agenda and rain outdoors. 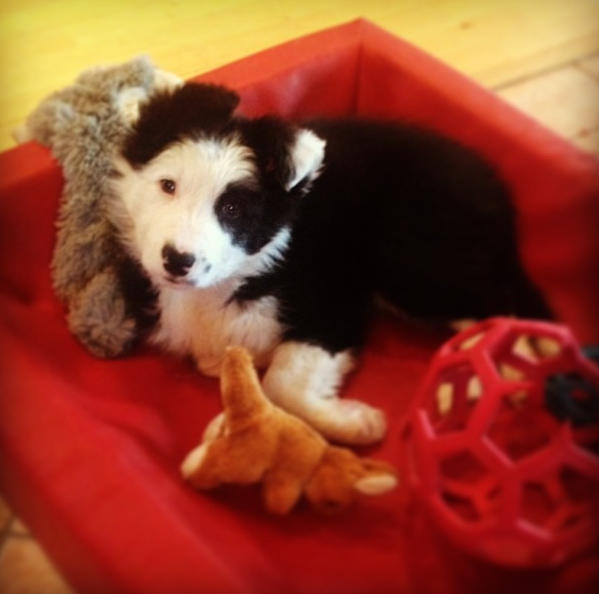 Thomas is at a sheep dog trial, so I’m at home alone with Wilco and most of the grown up dogs. Ordinary days are very rare here, so I’ll try to use it as well as I can. 7:10 – Wilco slept for eight hours and didn’t wake us until our alarm went off. Good puppy! Now out to potty. 7:35 – Breakfast. Wilco eats Vom og Hundemat – a raw mixture of meats and bones. He gets the puppy kind, and loves it! 7:40 -A 12 minute walk with Squid and Epic. He can come on our short walks as long as he ignores the other dogs and doesn’t do any other things that I don’t like. I suspect that this time of no herding other dogs will pass soon, and he will not be allowed on walks with the other dogs unless I am actively training him to behave. 8:00 – Playing with his toys. Playing a little bit with Sisko (Sarek’s sister, living with us for a week). Finally someone who wants to play with him! But she is a little too ruff, and play ends quickly. 8:20 – Asleep. Thomas has left for herding trial with Sarek and the kitchen is quiet. Time for me to have breakfast. 8:45 – Wakes up and walks to the door. I take him out to pee. 8:50 – He does not go back to sleep, so we play with a toy in the kitchen. I focus on tugging and that he drives back to me when I let the toy go. 9:00 – Full speed! He is biting my feet and throwing his metal bowl around. I want to have coffee and answer some e-mails. I try something that often works with small puppies. I give him pieces of apple (can be any fruit or vegetable really) to investigate/play with/eat. It works this time too! 9:30 – I did get some work done while Wilco was occupied with his apple and biting my feet. Let’s go for a small walk again. Sisko can come too. 9:50 -We’re back from outdoors. I brought two toys and tried to do as many recalls as possible. It wasn’t easy, as he didn’t want to leave me and the toys. He did follow Sisko or sniff the ground a few times, and I could call his name and play with him when he reacted. I also tried the switch game for the first time. As he as tugging on one toy, I would tease him with the other and add the cue “ja!” just before he let go of the first toy to grab the new one. It went very well! He was also rewarded for attention, as I couldn’t resist rewarding when he just wanted to stay connected with me when I took the toy away. 10:05 – Playing with his toys and apples while I work on the computer. 10:45 – I get up to clean the kitchen counters. Wilco wakes up and follows me calmly. I try to ignore him and hope that he goes back to sleep on his own. 11:00 – Wilco walks into the livingroom, so I decide to take him out before there is an accident. We go out in the sleet and it takes a while for him to pee. When we get back in, I find a puddle of pee in the livingroom. When did that happen? I keep moving arount the room calmly while cleaning, and I wait for him to fall asleep. He does lie down often, but if I walk too far he will follow me calmly. 11:15 – He falls asleep in his bed after 15 minutes. He is no longer disturbed by me moving around. 11:30 – I decide to take the grown-ups for a walk while Wilco sleeps. I will attempt to sneak out without waking him… He wakes up, but looks calm. When I get out I check on him through the window. He lies down on the rug. 12:00 – Back from my walk and I look through the window. He is asleep in his bed. This would be a perfect time to go to the grocery store. I’m hungry and out of food. But my wallet is on the table next to the puppy. I have to go in and wake him up. He wakes, but stays in his bed, so I decide to go. 12:20 – I am greeted by a happy puppy when I get back. I immediately take him out and he pees a lot right away. I can’t find any pee in the kitchen. Yes! 13:00 – I get distracted by a phone call during lunch, and Wilco pees on the floor again. Soon it’s time for his lunch, and my plan is to introduce the clicker to him. I’ll tell you more about that in the next post. I’m really looking forward to training a puppy again. I’m looking at old videos of Squid and get excited about teaching new things (on the other hand – my grown up dogs still learn new stuff all the time!) and think about how I would do things differently today. You do learn a lot in five years! Do you want to learn more about how we train, how to use shaping to teach new behaviors, how to create self control, stimulus control and drive? Check out our Foundation Class, starting tomorrow. This is how we started – cuddling, playing, resting and socializing. A week later – flying to Stavanger, Norway, and learning new skills. 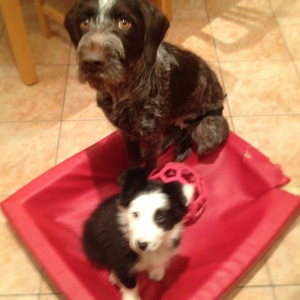 Eleven weeks old – circle work, finishes and self control in her crate. Fifteen weeks on New Years Eve. Many new tricks on her repertoire and training on stimulus control. Seventeen weeks old – visiting Bergen, Norway, new tricks and stimulus control. Being able to send your dog around a pole (or chair/cone/person/bag/whatever) is a great way to make your obedience training more fun and efficient. 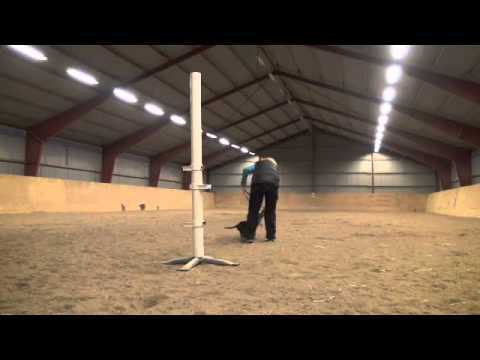 With the pole, you can get your dog on a distance and in full speed without having to work on stays. You can get new repetitions without having to move yourself. I use if for all kinds of things (finishes, holding dumbbell in motion, stand/sit/down on a distance and while running towards me, directed retrieve, the recall to heel in the square exercie etc.) You can also use it for agility handling. I’ve shown many of these things in the blog this winter and I will try to make an inspirational video with even more when I get the time (it would be much easier if the snow would melt from my training field so that I didn’t have to go to the riding facility to train). Win’s puppies have started to move out, but beautiful Bet will stay with us for a few more weeks. And of course, I have to do some training with her. Puppy training is so much fun. This is our first session on switching toys on cue (first step to a great toy retrieve) while still encouraging good weight shift and tug.